A good horror movie is made up of good direction, acting, writing, and cinematography. A great horror movie utilizes these techniques in almost every single scene to effectively tell the story, give a good scare, or build suspense. Everyone has their list of favorite films that they can watch over and over again. But what about those specific scenes that you always look forward to seeing when settling in with one of your favorites? Or that scene that has you nudging the person sitting next to you and saying, “You’ll love this part!” Certain scenes in a film can speak to us in any number of ways, and Scenes We Love will spotlight some of the best of the best. As a film with many iconic characters and classic scenes, one could almost call any chunk of Brian DePalma’s Carrie a Scene We Love. There’s the opening shower scene; any of the sequences at home with Carrie and her mother; the getting-ready-for-prom montage; and, of course, the most classic scene of all – Carrie getting drenched in blood and killing everyone at the prom. However, this choice for Scenes We Love will instead focus on the five-minute sequence leading up to that infamous blood spill. As a preface to one of the most recognizable moments in film history, this scene brilliantly builds up all the tension and suspense that is finally released by the falling of the bucket. The sequence starts at one hour and eight minutes into the film, with an uncut two-minute tracking shot that helps establish the geography of the scene. 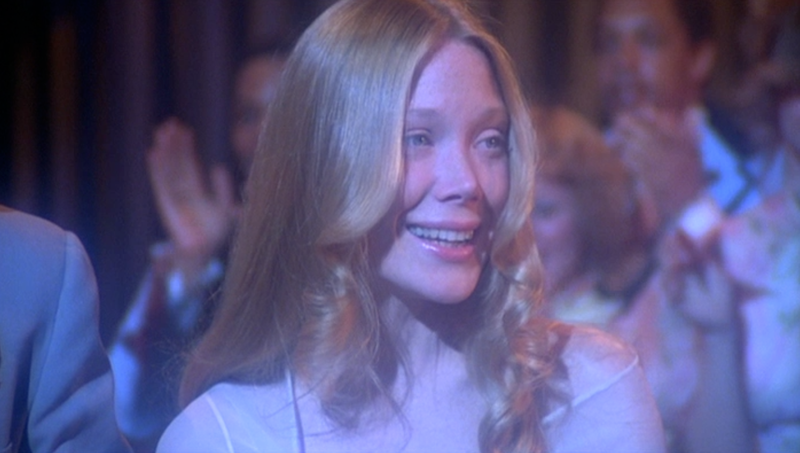 Norma picks up the voting ballot from Carrie White and Tommy Ross’s table, and the camera follows her as she walks from table to table, collecting more ballots. She and her partner in crime, Freddy, then go off into a little corner to discard the actual ballots and replace them with fake ones. The camera is still following Norma as she turns in the fake ballots to the vote counters, and then as she signals Billy and Chris, who are hiding underneath the stage. The shadow of the rope can be seen as the camera continues moving and shows the back of the stage, where Sue Snell appears as she is sneaking into the prom. 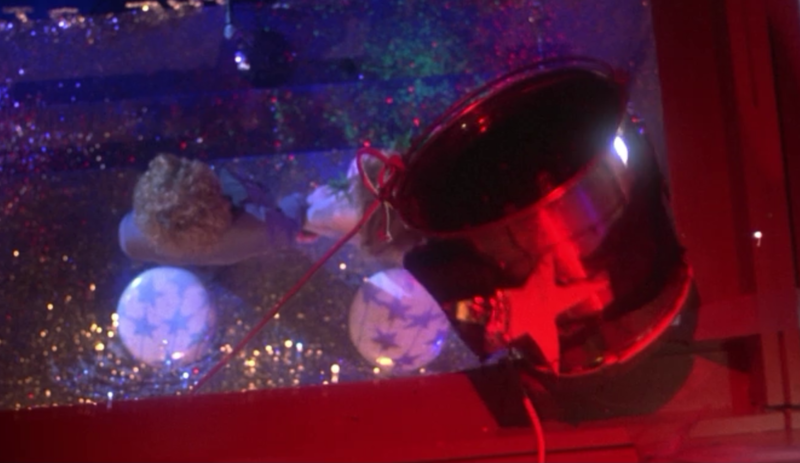 Craning up above the stage, the camera shows the rope and the bucket full of blood, just as Carrie and Tommy are announced as the prom queen and king. Going up and over the bucket, the camera then zooms in on Tommy and Carrie sitting at their table. This is a great almost Hitchcockian technique that DePalma uses to build the suspense in this scene. The audience is privy to most of the evil plan that Chris Hargensen has dreamed up for Carrie, but it is the next part of this sequence that really drives it home for them, with Sue being the one who plays the audience in the scene and discovers what is happening along with them. After the two-minute tracking shot, DePalma makes a pretty abrupt cut to a slow-motion sequence of Tommy and Carrie approaching the stage. It’s all very ethereal, with dreamy music playing in the background, and Carrie looking almost angelic with the bright white spotlight that is on her as she walks through the crowd of clapping prom-goers. The slow-motion continues for the rest of the scene. But as soon as the shot switches to Chris under the stage, the music shifts to something much more ominous and unsettling, so we know that something bad is going to happen very soon. Though sound and music is important throughout Carrie, Pino Donaggio’s fantastic score really shines through in this sequence. As the scene continues and the suspense builds, the music keeps switching back and forth between what we’ll call Carrie’s Theme and Chris’s Theme. It was a wonderful decision to use Carrie’s ethereal theme whenever the focus is on her for this scene because, since there is no dialogue, it emotes to the audience how wonderfully happy Carrie is in the moment and creates even more sympathy for her. As we see Chris gripping the rope and the bucket wobbling above the stage, we know now what is going on and we don’t want it to happen to this poor girl that we have come to care for so much. The audience’s only hope in this scene is Sue. As she is holding onto the edge of the stage, watching Carrie, Chris’s anxiousness to pull the rope causes it to jiggle under Sue’s hand. With Donaggio’s track “Bucket of Blood” almost stealing the entire show with its ominous chords, Sue steps out from behind the stage and sees the bucket on the rafters above. Her gaze follows a single streamer that falls from the bucket to where Carrie is standing, and the look of realization on Sue’s face is subtle, but nothing short of perfection. There is then another quick sequence that follows Sue’s eyes as she tracks the rope back down from the bucket to underneath the stage. She sees Chris’s shadow behind the blue paper and goes to look under the stairs. The audience’s hope that this horrible prank will be stopped is ruined by Mrs. Collins. This is a strange turn because she is one of the other characters, along with Sue, whom we have trusted through this movie. Mrs. Collins pulls Sue away just as she’s exposing Billy and Chris, and then forcefully drags her through the crowd and out the door. Donaggio’s score gradually speeds up in tempo the closer they get to the door, with Chris’s hands on the rope while she is devilishly licking her lips in anticipation. She realizes that this is her chance and finally pulls on the rope just as Mrs. Collins closes the door on Sue. This is actually an interesting moment to note for Mrs. Collins’ character–she thinks she has gotten rid of a possible threat against Carrie, but she turns around just in time to see her get covered in blood. The intensity with which Chris pulls on the rope, the gushing of the blood, and the smile that spreads on her lips (even though she can’t actually see the result of what she is doing) almost makes this act look like a sexual release for her because of the sheer pleasure she seems to get out of it. As the blood falls, the music almost becomes discordant with a tone that is slightly unpleasant to match the horror on the screen. The music then stops so the audience can only hear the exaggerated dripping of the blood and the sound of the swinging bucking overhead while the camera shows the different reactions that people have to what they are seeing. The prom massacre starts soon after this, but that could be an entirely different Scene We Love post. The five minutes before the massacre, though, are five minutes of very underrated filmmaking, editing, and musical composition. All of these elements work together in this scene to build up to one of horror’s most famous and well-known moments.